As nicer weather approaches, spending time at the playground seems to become part of most every child’s weekly routine. Unfortunately one bad apple can ruin a playground experience for all. Don’t be the bad apple. Be courteous and consider the safety of others when visiting the playground. Ensure that your child does the same. When visiting the playground, follow these etiquette rules. Rule #1. Assume responsibility for your child. Just because you walk through the playground gates doesn’t mean your child is on his own to have a good time. While other responsible parents may alert you if your child is doing something dangerous and going to hurt himself or others, the responsibility for his safety and his behavior towards others is yours alone. Don’t zone out. Pay attention and supervise your child. Be ready to intervene when necessary. Rule #2. Ask others for cooperation. There are definitely two schools of thought when it comes to the appropriateness of disciplining someone else’s child. To avoid battling it out with a parent of the other school, try soliciting cooperation from a child that’s behaving badly. “My child wants to go down the slide and if you don’t move, he may hurt you. Could you please move?” may get your further than saying “You need to move, now.” If cooperation is not granted, seek out the offending child’s parent and ask for help. Rule #3. Put the phones, smart phones, iPads and iPods away. While many parents take advantage of the time their child is playing at the playground to catch up on their emails, phone calls and text messaging, doing so is really not appropriate. 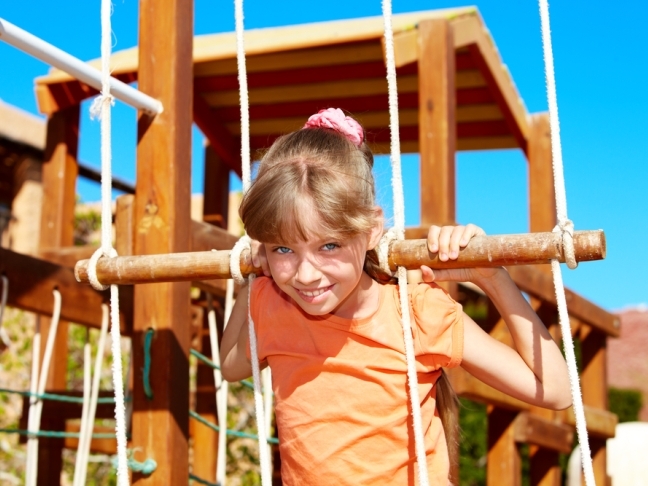 Children need constant supervision while on the playground, especially on a crowded one. Children can easily hurt themselves or others when they are unsupervised. Remember, you’re not only responsible for your child’s safety, you’re responsible for ensuring that he doesn’t cause injury or harm to others. Rule #4. Let everybody have a turn. If your child has been swinging on the swing and a line starts to form, that’s your signal to wrap it up. While you don’t need to remove your child immediately, you should definitely be courteous of others and give a two minute warning. Rather than make it a negative that your child has to end her turn early, use it as an opportunity to teach her about sharing and playing with others. Rule #5. Adhere to the age limit. There’s nothing worse at the playground than a 10 year old barreling down the slide designed for children ages 3 and under. Bring your child to age-appropriate play structures and ensure that they aren’t playing where they aren’t supposed to. At the playground, every parent or caregiver has to be their own child’s monitor. Take your role seriously. Don’t be that parent and child combination people pray isn’t at the playground when they pull up. There’s one of those in every neighborhood, for sure.